Curtis Knight Entertainment, "The Knot 2007 Best of Weddings Pick," has provided DJ / Entertainment services to New England since 1980. We are one of the largest DJ / Entertainment companies in the United States: a solid company with a well-proven track record and a stable future - with 42 DJs and 16 sound systems. Before, and after, you sign on with one of our 42 DJs, we look at you as an individual. We average more than 1,200 events per year and have pleased more than 5,000 individual clients. Our DJs have helped to make thousands of Brides & Grooms happy, and their Wedding Days a smashing success! Elegant and Classy, or Wild and Crazy, we have the high-quality, professional entertainer you want! We couldn't be happier with the "Curtis and Anna" package. 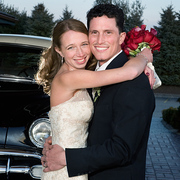 They are very personable and helped our wedding reception go on without any bumps. They even took pictures and videos during our reception, and they emailed us a video DAYS after the reception. Best Wedding Decision, EVER! The one thing you cannot "test" in advance, and even if you could at someone else's wedding, your crowd can always differ. With that, the advice people always give, is to go with a referral - I did, meet with them and go over the details - I did - But when it came down to it, things are going to change and Curtis and Anna were able to read the crowd perfectly, tastefully, and everyone ended up having a total blast!! Considering, I initially wanted a band, and conceded to a DJ to save money.. I can honestly say now that if I could do it all over again, and money was NOT an object, I would still choose Curtis and Anna over a band! A DJ doesn't pigeon hole you into one set of music and allowed a ton of flexibility in the play list, but I say that with a caveat - you have to have the right DJ who can read the crowd and know what to play by what they see - and I can say they definitely did that! Not to mention the fantastic candid shots that he puts in a sideshow for you to share with your friends and family after the event. He got some really amazing shots - that I am glad I didn't miss. We used Mark Cherone and he was AWESOME. So polite about getting our attention when he needed us and we were talking to relatives and friends. He also was able to get all the songs we wanted and add in some of the unusual things we wanted done. He was terrific, and definitely added to the night! Curtis and Anna did an AMAZING job at our wedding! I would absolutely recommend them to anyone.